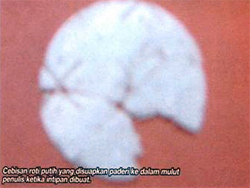 PETALING JAYA, 10 July 2009: The two Catholics who lodged a police report against the Al Islam magazine over an article in which the journalist took the holy communion wafer out of his mouth and photographed it, have started a peaceful protest campaign against the magazine. Joachim Francis Xavier and Sundhagaran Stanley, from Penang, are asking Catholics to make individual police reports and to express dissatisfaction with the magazine’s publisher through telephone calls or faxes. “We are resolved not to allow anger to guide our actions and instead pray that these ignorant will be forgiven by Allah,” they said. The two lodged a police report on 8 July 2009 at the Patani Road police station in Penang over the article “Tinjauan Al Islam Dalam Gereja: Mencari Kesahihan Remaja Murtad” which was published in the May 2009 issue of Al Islam. The magazine is published by Utusan Karya Sdn Bhd. In the article, the Muslim journalist, accompanied by another person, went to two Catholic churches in Kuala Lumpur on an investigative mission to find out if allegations that young Muslims were being converted to Christianity were true. The journalist, whose by-line in the article was Muhd Ridhwan Abdul Jalil, described the holy communion ritual as “upacara makan roti putih” and wrote about how he was given the wafer by the priest. The article also carried a photograph of the wafer with a caption that identified it as the wafer that was placed in his mouth. Xavier and Stanley in a press statement said they were “outraged that these Muslim men consumed it [the communion] only to spit it out later, have it photographed, and have its image published”. The two Catholics said it was “total disrespect” for what Catholics regard as sacred. “It strikes deeps into our hearts and invokes much anger,” they said. Catholics believe that the wafer is the actual flesh of Christ who, according to doctrine, died to remove the sins of people. “The ‘communion’ is held with great reverence and cannot in any way be mishandled or [treated] with a lack of respect. Even Catholics are not allowed to take home the ‘communion’ but are instructed to consume it immediately during the service. Catholics go through an elaborate process of preparing themselves to receive this ‘communion’ worthily and those who have not done so are advised to refrain from receiving it,” Xavier and Stanley said. They said they wanted the magazine to return the wafer to the church authorities. The magazine did not name the churches its journalist went to. The writer described scenes of hymn-singing and exchanging of greetings among the parishioners. At one of the churches he went to, the service was in Bahasa Malaysia. He noted that there were many Malay-looking people, but realised that they were from Sabah, and that there were many Filipinos as well. He wrote that he did not see any Muslims being converted, but dwelt at length on the use of the word “Allah” in the priest’s sermon and in some of the hymn lyrics. His conclusion in the article was that the ban on the use of “Allah” by Christians was valid because Muslims would be confused as there were differences about God between Islam and Christianity. Xavier and Stanley said the Muslim journalist and his friend had “violated our sense of privacy to freely worship”. “Would these men tolerate non-Muslims entering the mosque and violating the sanctity and holiness of their worship? All places of worship and the form of worship practised must be respected with the greatest sensitivity and reverence, be they the church, mosque, temple or gurdwaras. “Entering these premises with the intention to spy and to violate the sanctity of worship only serves to incite anger and hatred that could lead to potentially dangerous consequences that would tear this country apart,” they said. Xavier, when contacted today by The Nut Graph, said he lodged the police report after reading the article as a “concerned Catholic” even though the incident did not occur in his parish. He said the Penang police told him that investigations would be handled by the Bukit Aman in Kuala Lumpur, since the incident took place in the capital. The Nut Graph also called the Al Islam editorial desk for a comment. Its assistant editor Nor Shamsinor Baharin said the journalist who wrote the piece was on leave. She said she had been instructed not to comment or respond to any questions on the article. Catholic authorities in Penang and Kuala Lumpur were not immediately available for comment.